By fusing visible hyperspectral and x-ray fluorescence imaging, Northwestern researchers reveal sixth-century Roman law text hidden in a bookbinding. They may never make it to the big screen in an Indiana Jones-inspired adventure or top the best-seller list with a Da Vinci Code-like mystery, but an interdisciplinary team of Northwestern University researchers has generated a good measure of excite-ment among historians and scientists alike with a new, non-destructive technology that promises to reveal text hidden for hundreds of years inside ancient bookbindings. Between the 15th and 18th centuries, bookbinders recycled the bindings from medieval parchments into new binding materials for printed books. While scholars have long known that books from this time period often contain hidden fragments of earlier manuscripts, they never had the means to read them. The book responsible for sparking the study is a copy of Greek poet Hesiod’s Works and Days from 1537. Purchased by Northwestern in 1870, the copy is the only remaining imprint retaining its original slotted parchment binding. Although this binding originally caught the attention of Northwestern librarians, the suggestion of writing beneath the parchment on the book board excited new interest. When NU-ACCESS researchers studied the book’s cover, they noticed that the bookbinder tried to remove the writing on the book board, likely through washing or scraping. But it retained two ghostly columns of writing surrounded by marginal comments. 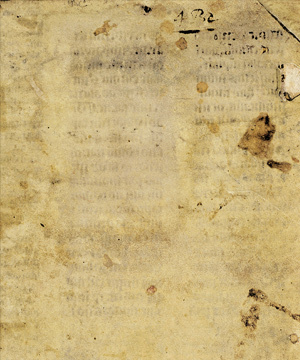 Walton and Pouyet used a visible light hyperspectral imaging technique to view the writing, but it yielded poor results because of the parchment’s irregular degradation. While the technique made the writing a bit clearer, it was not legible enough for Northwestern historian Richard Kieckhefer to read. Next, the pair tried x-ray fluorescence imaging using a portable instrument. 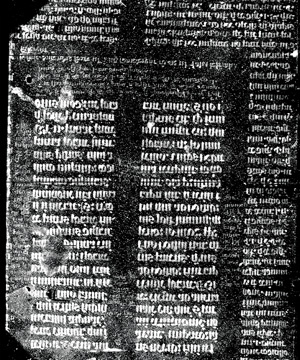 The technique provided the first information about the ink composition, but the text remained unreadable. In search of a more powerful imaging source, Walton and Pouyet sent the book to the Cornell High Energy Synchrotron Source (CHESS) in Ithaca, New York, where the bright x-ray source and fast detection system allowed for a full imaging of the main text and marginalia. When the researchers sent the more clearly imaged writing to Kieckhefer, he immediately recognized it as sixth-century Roman law code with interpretive notes referring to the canon law. Walton and Pouyet hypothesize that the parchment originally might have been used in a university setting where the study of Roman law formed a basis for understanding canon law, a common practice in the Middle Ages. Eventually, the legal writing was covered and recycled, most likely because society had already struck down the Roman laws to implement church code. Using a machine-learning algorithm developed by his team, Katsaggelos discovered that rather than using one imaging technique, a fusion of two would yield the best results. His team combined visible hyperspectral imaging, which includes wavelengths within the visible light spectrum to provide high spatial resolution, with x-ray fluorescence imaging, which provides high intensity resolution. The algorithm informed the researchers of the relative contribution of each to produce the best image. Katsaggelos’s data fusion image was so clear that it rivaled an image of the main text that had been produced by the powerful x-ray beams at CHESS.